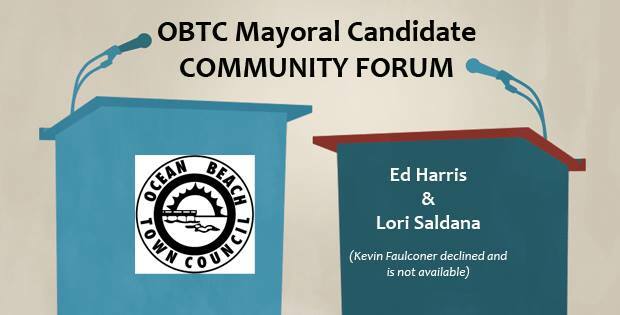 This Wednesday, April 27th, the Ocean Beach Town Council will host a “Community Dialogue” on the upcoming mayoral election taking place on the California Primary, June 7, 2016. Candidates Ed Harris and Lori Saldaña have confirmed their participation; Kevin Faulconer declined and is not available. 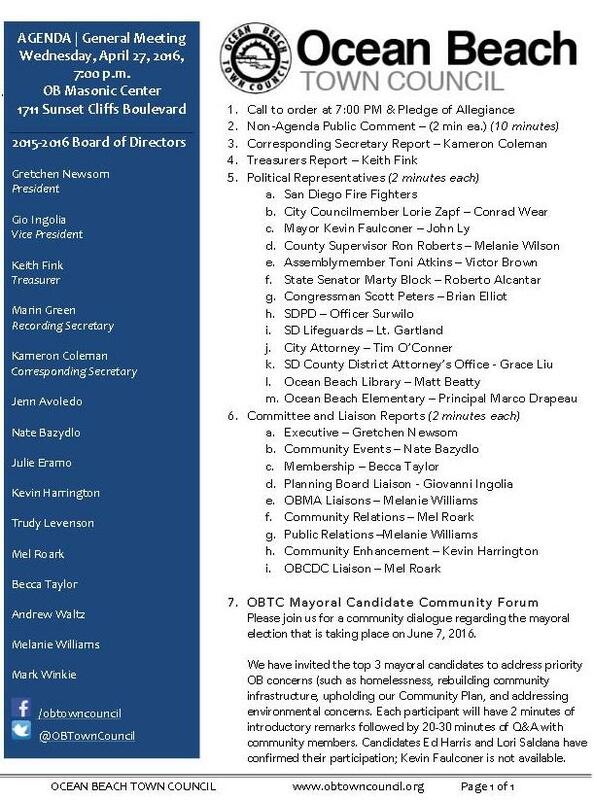 The OBTC invited the top 3 mayoral candidates to address priority OB concerns, during the monthly Town Council meeting. These concerns include – but are not limited to – homelessness, enhancing our quality of life, rebuilding crumbling community infrastructure (specially related to flooding in 92107), upholding our Community Plan, and addressing environmental concerns such as climate change, cliff degradation, the plastic bag ban, and water quality at our beaches. Each mayoral participant will have 2 minutes of introductory remarks followed by 20-30 minutes of Q&A with community members. Responses to questions will be limited to 2 minutes for each candidate, but we strive to allow for a quality dialogue between candidates and our community. The OBTC is hoping that questions from audience members will be phrased to be applicable to all candidates. Everyone is welcome. Please join the OB Town Council meeting this Wednesday, April 27th at 7:00pm at the Masonic Center at 1711 Sunset Cliffs Blvd.